Synergy boasts a strong reputation when it comes to the quality and craftsmanship of our inground fibreglass pools Adelaide. Our range is engineered to be 20% stronger than the offerings of our competitors, giving us great leverage within the pool and spa industry. To support this claim, we offer an Extended Lifetime Structural Warranty on our products to coincide with our value-for-money guarantee. Our fibreglass pools boast a smooth surface finished with anti-microbial technology to prevent against algae growth and reduce maintenance. As a result, your pool will stay in great condition all year round! We can have your project finished and ready to go within 2-4 weeks. This includes everything, from design and site preparation, right through to concrete edging, fencing and landscaping. Save the fuss and arrange your pool installation with Synergy Pool and Spa today! Call to hear more about our inground fibre glass pools Adelaide. To enhance the longevity of our inground fibreglass pools Adelaide, the pool surface is covered by our Colour Guard Lifetime Interior Surface Guarantee to ensure long-lasting impact. We’re confident that your fibreglass pool will never discolour or fade because we use technology which counteracts these risks. Within our protective range, there are plenty of colours for our customers to choose from! Additionally, we offer a diverse variety of geometric designs to give your home a unique contemporary edge. Our pools add great value to your outdoor living space, and every aspect of the design is tailored to suit your lifestyle needs and preferences. To correspond with our luxury designs, we have also adopted cutting-edge filtration equipment to help keep maintenance low. Our team can recommend the most economical alternatives for those who are working within the constraints of a budget! For a full-scope service, flexible designs and promised durability, Synergy is the right team to contact for your inground fibreglass pools Adelaide. Before commencing with the installation of our inground fibreglass pools Adelaide, designs and selections are in negotiation. Once a decision has been finalised, the design is sent off for engineering and council approval. After the go-ahead has been appointed, our team can immediately get started on construction! The preparation of your yard is important, so we completely eradicate any branches, pavers or shrubs that may interfere. Excavation comes next in the process, and our team have completely mastered the art of digging with minimal disruption—removing the excess dirt as we go to keep our site tidy. The hole is prepared using screeding sand which levels the pool in preparation for gradual ground movement. By crane, your pool is delivered and installed, fully equipped with your preferred lighting and plumbing arrangements. Your pool is secured with cement and the plumbing is finalised before we give the go ahead to fill it up! For the best inground fibreglass pools Adelaide, trust Synergy Pool and Spa. We’re the best at what we do, and manufacture right here in Australia for better quality control! As well as taking care of your pool, we also cover all landscape developments to create a luxurious hideaway in your home. 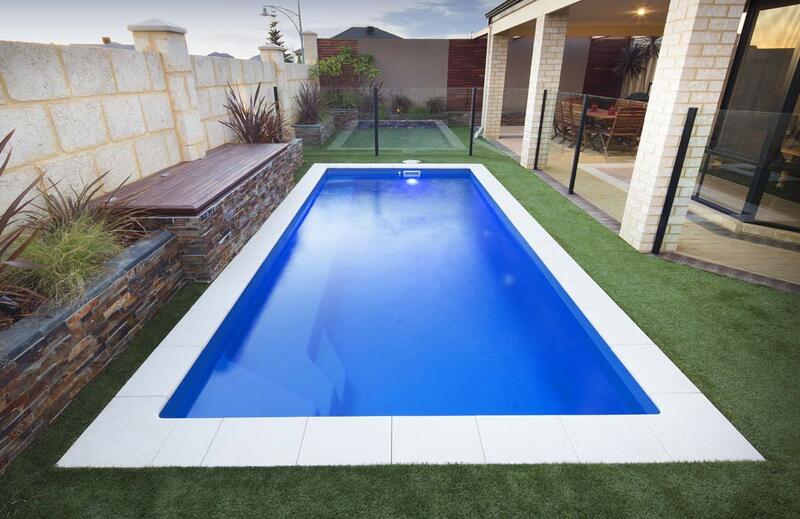 Call (08) 83250543 to request a quote on our inground fibreglass pools Adelaide.